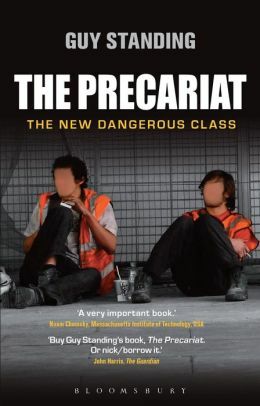 London When I first saw the term “precariat,” it was used by a labor relations professor in the United Kingdom referring to my advocacy of the need to aggressively organize lower waged workers into unions. Though I wasn’t sure I had heard the term used before I was pretty clear we were talking about families whose lives and work were precarious meaning uncertain, unstable, and without income security or what I’ve called “citizen wealth.” All of which led me to a recent book by a British economist named Guy Standing, called, The Precariat: The New Dangerous Class, which I finished reading before boarding a plane to London. I’ll need to ask around and get a better feel for how widespread the sense of the precariat is in England, though my small sample indicates it’s in somewhat common usage among those people interested in some of the more disconcerting manifestations of globalization not only in Britain, but around the world. Certainly Standing ramps it up a notch by linking this emerging precariat with street riots in London and other English cities in recent years reflecting the alienation and anger of young people who are increasingly futureless without long term and certain job prospects. The English may be working to coin a name for this rapidly growing segment of society. Certainly it’s everywhere now. The loss of job security has turned the Japanese economy upside down for workers. When we visited with the Tahir Square demonstrations in Egypt several years ago, it was clear that the anger in the square was driven by a central demand for job stability and meaningful work. Furthermore, the United States has absolutely earned the dubious huge distinction of creating the model for precarious employment typified by the temporary, part-time and casual work of McDonalds and Walmart. The evidence was as close at hand as a discussion in a recent Wall Street Journal of what experts considered the viable options for a home health care employer and its 500 workers in California as companies prepare to deal with new state regulations requiring such workers to be paid overtime for over 45 hours. One of the viable options advised by the experts was that the company “turn its employees into independent contractors.” It would be simple to do so. The company “would have to pay a one-time fee of about $150 per employee, mostly to update legal documentation and procure a business license for each of the contractors,” but simultaneously the company “would save the 15 percent of payroll that is paid in payroll taxes and the 18 percent, or so, that is paid for workers’ compensation insurance.” Those payroll taxes of course include unemployment insurance and social security payments underscoring how tenuous or should we say precarious, the newly minted worker would be with this sleight of hand. This is homecare, but the same thing is happening in jobs throughout North American and abroad. Hotel maids that are now subcontractors at Hyatt and Wyndham hotels with lower wages and more rooms. Cleaners, garbage workers, and many others who once were public employees and are now casual, temporary or on-call. The examples are now boundless. Standing has a good number of recommendations for how to respond to the creation of this new emerging class of workers including a guaranteed annual income, and certainly that’s not inconsistent with our own views. He is defensive about criticism for his views on whether labor unions will pick up the banner here, but none of that is surprising either, and this is likely part of the reason why Professor Jane Holgate, a co-author of Union Voices: Tactics and Tensions in UK Organizing, connected my arguments about the ways and means that unions and community-based organizations needed to step in the gap with new organizational models to build collective formations for such informal workers. Standing is an economist not an organizer so in all fairness that’s really outside his scope. Where he almost stumbles into a solid part of our current analysis is in his plea towards the end of the book for such workers to have some forms of representation to make it through so many mazes, which dovetails with our efforts to create exactly that with our new Citizen Wealth Centers in the USA seeking to fill part of that vacuum as a stopgap and precursor of larger concerted activity and organization that must then follow. Dangerous or not, these are workers that can be and are demanding to be organized, and with their growing numbers in countries around the world can’t be ignored much longer except at our own peril. Wade Rathke founded the Association of Community Organizations for Reform Now (ACORN). He served as ACORN’s chief organizer for thirty years. He is the publisher and editor-in-chief of Social Policy, a quarterly magazine for scholars and activists. He blogs here, where this post originally appeared.